Grayson Perry's exhibition, The Most Popular Exhibition Ever!, at the Arnolfini in Bristol comes at an opportune moment. As students of research methodologies, we couldn't ask for a more accessible example of an artist's research and making process, from start to finish. This is the second Perry exhibition that I've seen, the first being The Vanity of Small Differences (2016, Victoria Gallery). 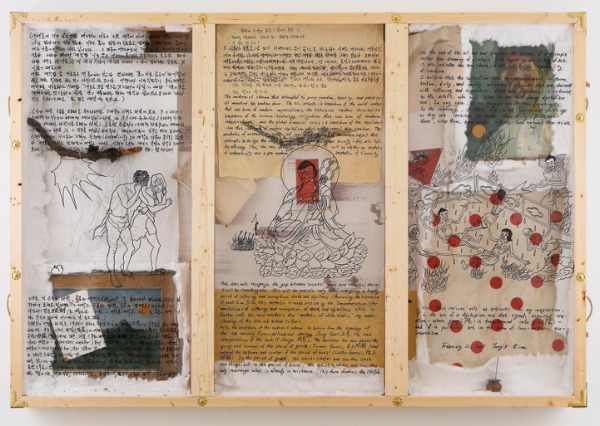 Then as now, Perry has deployed a repeatable methodology that involves a form of anthropological fieldwork that takes us full-circle from inception to reveal of the finished artwork back to the subjects of his research. The Most Popular Exhibition Ever! Installation view (2017). Arnolfini, Bristol, UK. 29 October 2017. The Most Popular Exhibition Ever! felt refreshingly transparent. The work on exhibit is the result of his long-term project, All Man (2016, Swan Films), a documentary that investigated multiple aspects of English society and culture to understand masculinity. Perry admits that he had to overcome his own prejudices, and the impact of a traumatic childhood with a father insensitive to his needs. He coaxes transparency from the people he studies, uncovering deeper emotions beneath their macho behavior. His entire process is transparent - from conception to research through making - by giving us access to his sketchbooks and video footage of him in various socioeconomic groups, in the studio, and video of him discussing the work. Grayson Perry (2017), Matching Pair (detail). Arnolfini, Bristol, UK. 29 October 2017. Perry's research methods sit somewhere between non-participant observation (NPO) and participant observation (PO) (Gray, 2004) starting with a personal struggle or question, then using interviews, observation, participating in group activities, open calls for content via social media; sensitive documentation via photos, video, documentary film, and sketchbooks - all of which make sense and seem quite accessible for conducting research into cultural and social norms. Grayson Perry (2016), Death of a Working Hero. Arnolfini, Bristol, UK. 29 October 2017. One of the most powerful outcomes of Perry's process is that he shares the work he makes with the people who inspired it. It feels like a form of ritual, validation and healing for everyone involved, completing the vase or tapestry through the viewers' response to the work. The process seems complete for Perry as he reflects on how what he learned transformed him in relation to the original struggle that inspired his search for answers. Thank you, Arnolfini and Grayson Perry, for curating this exhibition in a way that makes it highly transparent and extremely relevant for those of us digging our way through learning how to do proper academic research in service of our practice. Swan Films (2016) Grayson Perry: All Man. Available at:http://www.swanfilms.tv/productions/grayson-perry-all-man/ (Accessed: 30 October 2017). The Most Popular Exhibition Ever!, (2017) Arnolfini, Bristol. 27 September - 24 December 2017. Victoria Gallery (2016) Grayson Perry: The Vanity of Small Differences. Available at: https://www.victoriagal.org.uk/events/grayson-perry-vanity-small-differences (Accessed: 30 October 2017). On October 7th I went to see Kim Yong-Ik's exhibition, I Believe My Works Are Still Valid, at Spike Island in Bristol. I was introduced to his work by Spike curator Georgia Hall, who invited me to conduct a workshop there after seeing my mixed media stitched paper series during an Associates crit. As part of their monthly I Am Making Art public outreach programming, they invite artists to teach whose work is loosely associated with or inspired by the current artist on exhibit in their main gallery. Naturally, I was eager to learn more about Kim Yong-Ik's work. I Believe My Works Are Still Valid. Installation view (2017). Spike Island, Bristol, UK. 30 September to 17 December 2017. Kim Yong-Ik is a South Korean artist, activist and teacher who trained as a Dansaekhwa (Korean monochrome painting) modernist. Early in his career, influenced by Duchamp and Minjung ("people's") art, he started "refusing" his identity as a modernist painter in response to the repressive political environment of a military dictatorship in the 1970s by leaving his folded canvases in their shipping containers to exhibit. He became known for this tension between embracing and distancing himself from modernist roots. His airbrush paintings on canvas that are removed from the frame and draped on the wall communicate this dichotomy. Plane Object (second version 2015, after lost original of 1978-79), detail. Airbrush paint on cloth. I Believe My Works Are Still Valid (2017). Acrylic on canvas, mixed media on paper, wall drawing. Spike Island, Bristol, UK. 30 September to 17 December 2017. To Spike Island 2017 (third version 2017, after original of 1997, second version of 2016). I Believe My Works Are Still Valid (2017). Acrylic on canvas, mixed media on paper, wall drawing. Spike Island, Bristol, UK. 30 September to 17 December 2017. In his Spike Island exhibition, Kim Yong-Ik installed site-specific paintings that engage with the exhibition space through pencil lines and handwriting directly on the gallery walls. He also hung pieces that add depth, layering and dimensionality to the flat surface of a canvas, using unconventional materials and techniques. Triptych (1970-2015). I Believe My Works Are Still Valid (2017). Acrylic on canvas, oil on canvas, cloth, cotton, wood, ink on paper, coins, incense burner, oil-based ink on acetate film. Spike Island, Bristol, UK. 30 September to 17 December 2017. I appreciate the lighter touch he takes by inviting the viewer in for a closer look at quiet messages and wry comments. Curious observers who crouch down where wall meets floor and lean in to decipher his scribble are rewarded with layers of information and meaning. These actions rendered the work more accessible and intimate, only one degree of separation from the artist through his handwriting. To Spike Island 2017 (third version 2017, after original of 1997, second version of 2016), detail. I Believe My Works Are Still Valid (2017). Acrylic on canvas, mixed media on paper, wall drawing. Spike Island, Bristol, UK. 30 September to 17 December 2017. Seeing an artist of Kim's accomplishment work this way was informative, inspiring and validating for my own practice. What was surprising is that I didn't expect to experience his work as "installations" and yet this is exactly what I was drawn to. This exhibition informs my thinking about my aim to move from two- to three-dimensional work, how to add layers of meaning and imply memory through text and materials, tactics for creating intimacy and transparency, and site-specific responses for an installation. 1, 5, 2, 6, 7, 3, 8 (second version 2017, after lost original of early 1980s). Site-specific installation, detail. Pencil, paperboard on wall. I Believe My Works Are Still Valid (2017). Acrylic on canvas, mixed media on paper, wall drawing. Spike Island, Bristol, UK. 30 September to 17 December 2017. Spike Island. (2017) [Instagram] 25 September 2017. Available at: https://www.instagram.com/p/BZdjT6fjcGI/?taken-by=spikeisland (Accessed: 21 October 2017). Spike Island (2016). Exhibition: Kim Yong-Ik. I Believe My Works Are Still Valid. Available at: http://www.spikeisland.org.uk/events/exhibitions/kim-yong-ik/ (Accessed: 21 October 2017). artnet (2016). artnet Asks: Kim Yong-Ik and the Legacy of Modernism. Available at: https://news.artnet.com/art-world/artnet-asks-kim-yong-ik-legacy-modernism-791375 (Accessed: 21 October 2017).